As mentioned more than a few times this season on MetsToday, John Maine has a minor mechanical flaw in his delivery that is causing his command to be off. If he keeps it up, he’ll have more issues than not throwing strikes — he’ll blow out his shoulder. Lee Mazzilli finally mentioned the flaw on SNY, for everyone to see. Maine is opening up his front shoulder too early, causing his right arm to lag behind, and his hand to get to the side or under the ball. In turn, his release point is also off — generally a little higher than normal. All this means that he is not putting his pitches where he wants them — the tipoff is seeing his fastball and changeup fly up an in to righthanders / up and away to lefties. However, it is not as simple as telling John to keep his front shoulder closed. 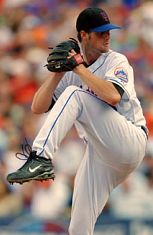 I’ve been teaching pitching mechanics for almost 20 years, and know that the command being off, and the front shoulder flying open, are symptoms. Usually, a symptom like that is caused by something else not as noticeable in the delivery — something happening earlier in the motion. It can be as simple as a tilt of the head, placement of the foot on the rubber, or in John’s case, where he’s breaking his hands. 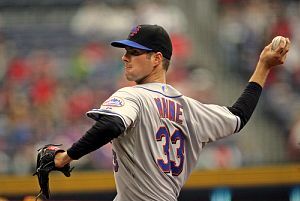 Since joining the Mets, this opening of his front shoulder has been occurring on and off. Usually, Maine is able to get a good release point in spite of it — but he’s really working against himself. It all starts with where he brings his hands at the start of the leg lift — up behind his right shoulder, next to his ear. Stand in front of a mirror, and put your hands together in front of you. Now move them up behind your right ear. Look at your left shoulder — what did it do? It turned to the right; simple biomechanics. Now if you buy into the idea that “every action results in an equal and opposite reaction”, then that turning of the shoulder is going to result in the opposite: a turning out of the shoulder. If you watch John Maine pitch — and it’s most noticeable from the stretch — you see his hands go back behind his ear during the leg lift, causing the left shoulder to turn toward second base. Then, when he comes out of his lift, to begin his stride, the front shoulder is already starting to open up (see picture at top of the article) — the previous over-rotation is causing an equal and opposite over-rotation. The picture to the right is an example of John over-rotating the front shoulder — see how he is “carrying” the ball almost behind him? Look where the front/left shoulder is pointing — not straight toward home but behind a righthanded hitter. To compensate for being that “closed”, the shoulders over-rotate to “open”, causing the arm to drag. I wish I had better pictures to explain, or access to video to show, but MLB has a thing about posting their property. As it is I’m sure someone will email me with a “cease an desist”. But it’s all to help Johnny Maine! What John can do — and probably has done in the past — is adjust where his hands go up. He can probably try stopping his hands once they reach shoulder level, or better yet, bring his hands up closer to the middle of his body, toward his chin for example, to keep that front shoulder from over-rotating. This picture to the left shows a decent place where he has brought his hands in the past. Lately, he’s been taking them higher and further back / toward centerfield. This can be fixed in about 10 minutes — with no Jacket required. Great post, wish I knew more about pitching mechanics though. However, is it just me, or does John Maine have the same problem as Aaron Heilman had earlier on where he was being too fine with his pitches and forgetting the fact he throws in the mid 90’s?